We got up early to leave for Alexandria but the forecast wasn't good and it was raining and windy. We decided to wait till 9:30 and then review the situation. By then the winds were less and we plowed our way out of the Colonial Beach harbor at low tide. Our ETA for Alexandria was 6:00PM which is later than we like. 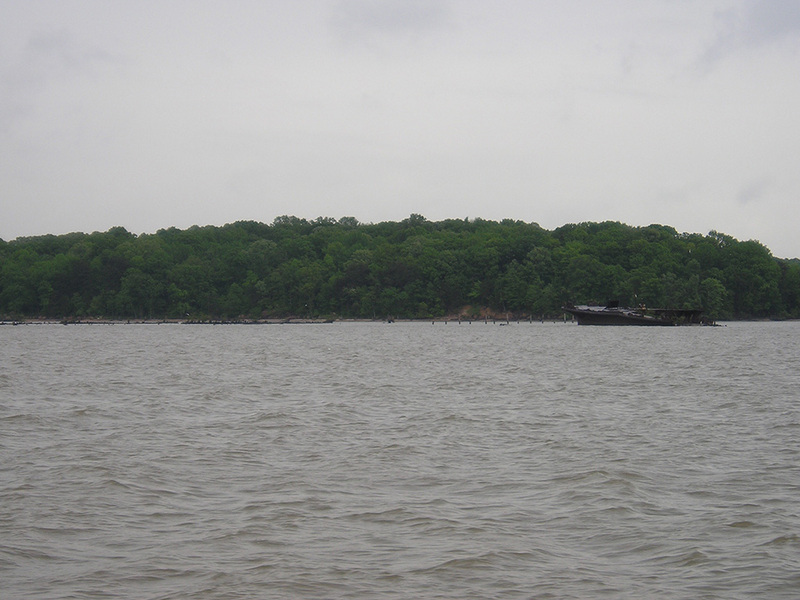 Then a couple of miles out Range Boat #4 approached us and said that we couldn't continue on our course as the Naval Proving Grounds at Dahgren were firing weapons into the Potomac. However, they said if we crossed the river we could continue along the north shore and we would be out of harm's way. At that point were guided by Range Boat #2. As it turned out we were helped by the tidal current and arrived in Alexandria about 5:30PM. This was our first day of rain for the entire day. We passed Mallow's Bay; (see photo) the graveyard for 285 wooden ships built during WWI. The German submarines were decimating Allied shipping so 800-1000 wooden ships were planned to be built quickly. By the time 100 were built the war was over. However they kept building them. They were built out of unseasoned wood, were badly designed, dangerous to sail, and expensive to run and keep afloat. So they were all towed to Mallow's Bay and burned to the waterline so scrap metal could be removed. Only the 'bones' remain.